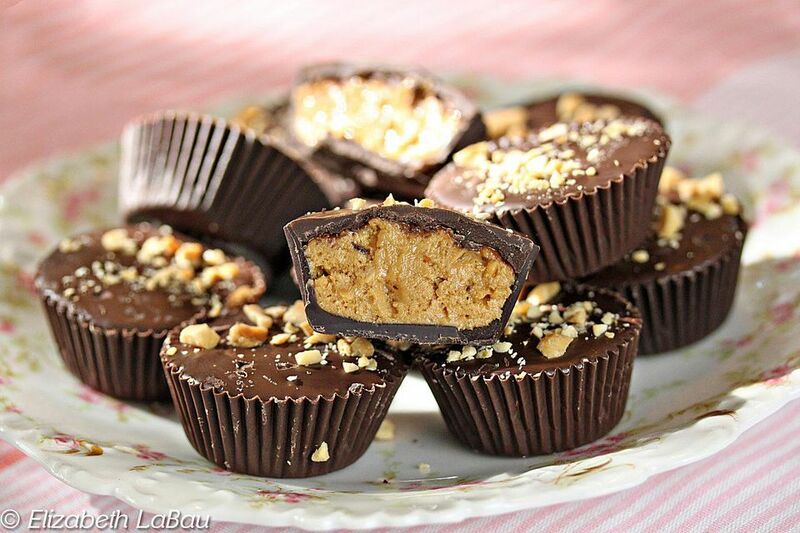 Chocolate peanut butter cups are a classic candy, and for good reason! Salty, nutty peanut butter and rich, smooth chocolate are the perfect match. Learn how to make peanut butter cups at home and enjoy this beloved treat anytime! Be sure to check out the photo tutorial with step-by-step pictures showing how to make chocolate peanut butter cups! First, prepare the chocolate cups. You should either temper your chocolate or use chocolate-flavored candy coating. While you can simply melt regular chocolate and use that, I don't recommend it, because untempered chocolate gets soft at warm temperatures and often develops white or gray streaks as it cools. So begin by tempering your chocolate by following these directions or melting your candy coating. Fill your cups with a small spoonful of melted chocolate, then use the paintbrush to paint the chocolate up the sides of the cup to the top. Try to create an even layer, and inspect the cups as you finish them to make sure there are no weak, streaky areas. Once all of the cups have been lined with chocolate, set aside the remaining chocolate for later and let the cups set at room temperature or in the refrigerator until they have hardened. While the cups are setting, prepare the filling. Combine the peanut butter, powdered sugar, and salt in a bowl and stir them together until they're well-mixed. When the cups are set and the filling is made, use a teaspoon or small candy scoop to drop balls of filling into the chocolate cups. Pat them down gently so they don't mound up over the top of the cup. Fill them until they are almost full, but leave space at the top to cover it with chocolate. If the chocolate has hardened, re-warm it until it is fluid once more. Spoon the chocolate over the cup and spread it to the edges, letting it flow over the top and sealing the peanut butter in the cup. Gently tap the cup against the counter to smooth out the top. Refrigerate the peanut butter cups to set the chocolate, for about 20 minutes. After the chocolate has set, your peanut butter cups are ready to be enjoyed! Store them in an airtight container in the refrigerator or at cool room temperature for up to two weeks.